The Chronicle of Cultural Misandry: National Organization for Women's Direct ties to Marxism and their Anti-Family Agenda. National Organization for Women's Direct ties to Marxism and their Anti-Family Agenda. "It was 1969. Kate invited me to join her for a gathering at the home of her friend, Lila Karp. They called the assemblage a "consciousness-raising-group," a typical communist exercise, something practiced in Maoist China. The only way to do this was "to invade every American institution. Every one must be permeated with ‘The Revolution’": The media, the educational system, universities, high schools, K-12, school boards, etc. ; then, the judiciary, the legislatures, the executive branches and even the library system." 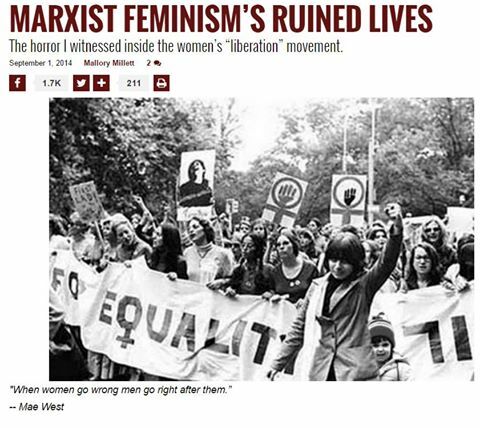 If anyone needed more proof of the ties of Marxism and feminism, here it is folks! And they had some common goals. Wonder why your political, educational, media, entertainment, academic, military establishments are all basically sold out no more! We have solid proof of a conspiracy.